I'm super excited to have yet another awesome giveaway for you guys! This time the lovely Savannah of MaieDae is hosting. Here she is to introduce herself! Savannah here from MaieDae! I run a fun blog all about inspiration, creativity, nesting, life and the joys of being a new wife. I also have an Etsy shop where I sell my vintage inspired handmade accessories - turbans, giant headbands, personalized necklaces, sparkly rings and more! I ALSO offer graphic design services through MaieDae and have loved creating blogs, wedding stationary and logos for some amazing ladies. I love my husband, my green-eyed kitty; Kaito, french fries, mid-century dinnerware, magazines, moleskine journals, technology and sweets! 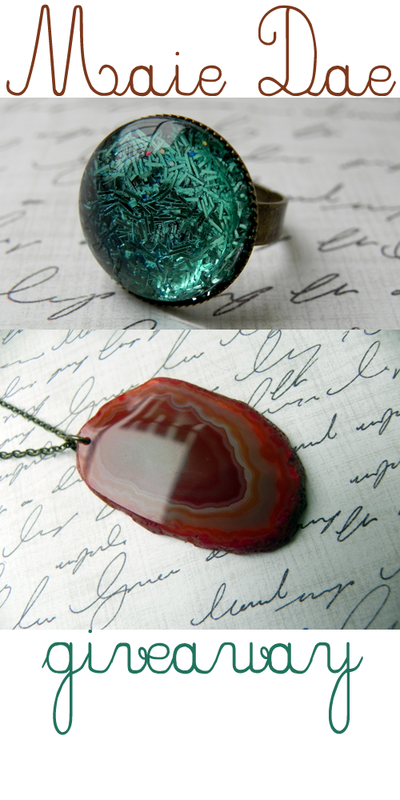 One of Savannah's beautiful Geology rings and an equally beautiful Geode necklace! So pretty! 1. Visit shop and tell me your favourite item. 1. Spread the word about the giveaway and link back here. 2. 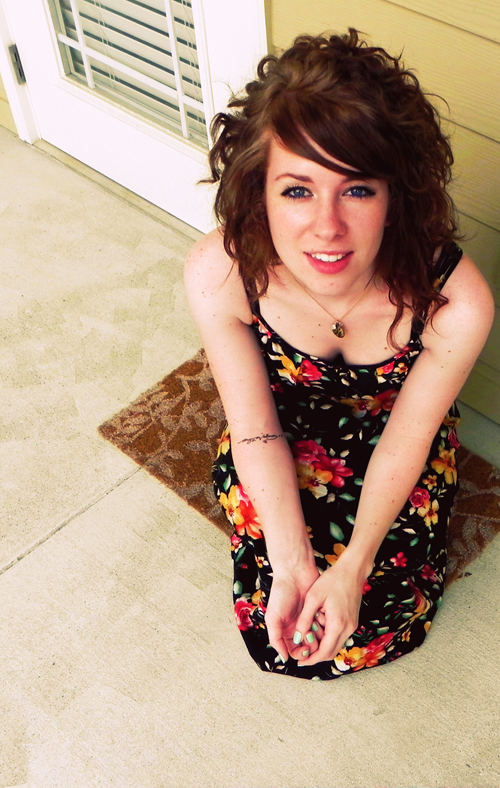 Pop by Savannah's blog MaieDae and say hello! I will announce the giveaway winner April 28th! If you just can't wait to see if you win the giveaway Savannah is also offering 20% off anything in her shop with the code ILOVEELYCIA. hooray!! Isn't Savannah awesome?! Those geode necklaces are beautiful! i loooooove those geode necklaces!!! Also, I'd love to see more of your drawings. It's one thing that I cannot do (seriously, my kids draw better than I do) and love to see what other people come up with. I love everything about your blog! don't change a thing! I love the amethyst geode necklace! Also, I'd like to see more beauty tips--you have the cutest hair! I would LOVE to see more recipes!!! What a pretty shop! I absolutely love the navajo necklaces. It's perfect for summer dresses! Although I would go nuts for anything else in the shop too! I love geodes and those sparkly rings! ooh, i love the Amethyst Cocktail Ring, it's my birth stone, loves it!! Pretty much in love with the Geode Necklace Feldspar #401. Prettiest teal ever! I think your blog is pretty great. I LOVE the "Darling and I" necklace. How sweet! As far as what to do more of? DIY's. With that said I realize the amount of work that goes into ONE DIY post and realize they are very time consuming. But my eyes light up every time you have one. I'm in love with the rings. They are all beautiful, I can't pick a favorite!! I like the Geology: Feldspar Cocktail Ring...which is the one thats up there. so pretty!!! i love ALL of the geode necklaces and sparkly rings! as for what i would like to see more of on your blog... i think you are doing a great job, but i always love to see tons of photography so you should post more of that! I love the feldspar necklace, but everything is so gorgeous! I love! I would love to see more outfit posts and maybe more DIY or tutorials! Thank you for such a fun blog to read! I follow savannah! I looove her necklaces. I was thinking about buying one, maybe I'll win one too! Do you really think someone can choose just ONE favorite?! I love everything! My favorites are the cocktail rings and the necklaces (create, imagine & ignite)... Love it all! So many lovely items, but I think I love the Navajo Feather necklaces best! i love the ignite necklace! and of course i follow maiedae's blog! I'd like to see more DIY's and your crafty side! :) I also really love the outfit posts, you have such a unique, funky style, love it! definetly the Born to Ignite Necklace!! But let's be real..it's all amazing! I want to see more of your outfit posts. You got some mad style skills, miss! And more of your sewing. That velvet dress was just absurdly amazing, and we need more of that bidness! I commented on her lovely, lovely blog, too! my favorite item would be the geology feldspar ring. vair nice. just posted a comment on her blog! i need to start checking it out more. for sure. oh, and i'd like to see more recipes! that's just me loving baking and everything that is colorful!! I love love love the personalized bubble necklace! SOO cute!! I adore the Geology: Rainbow Stone Cocktail Ring! I really like the Born To Ignite Necklace! I posted a comment on her blog! Her style is really cute! I really like DIY's so posting more of those would be awesome! Oooh!!! So gorgeous! I'm totally loving the amethyst geode necklace. I'm a sucker for purple! AND!!! I said hello to Maie on the TV list! She is so adorable. Great find! Also, I said hello to Maie! More updates on your shop! i love the personalized necklace best! and thank you for a generous giveaway! I love the Geology: Amethyst Cocktail Ring! The geode necklaces are fantastic, and the Hematite No 102 geode necklace might be my favorite of the bunch! I really love the rainbow stone cocktail ring! There are so many things it could be paired with! && all the things with feathers! totally following MaieDae. Love it! specially the project restyle posts! such good ideas! I am IN LOVE with that geode necklace. The colors are incredible and I would wear it all the time. I adore the Geology: Hematite Cocktail Ring! my favorite is the opal fire cocktail ring. such beautiful tones. I already follow and love reading MaieDae. I love the geode necklace in the amethyst color! I'm a new reader and I love the vlogs you've done - I'd like to see more of those. In a completely non-creepy sort of way. Hah. LOVE the Geology ring!! Especially the rainbow one, so pretty and unique! Oh, I love all your thrifty finds! And your video blogs! my favorite for sure is the "born to ignite" necklace. I just love the word, ignite! haha. Ooh, the hematite studs are really pretty :) What a neat giveaway! I LOVE the Geode Necklace: Hematite No.102!! It's GORGEOUS! I love the Geology: Feldspar Cocktail Ring. Catches the light perfectly! I looove the Into The Woods Headband !So pretty! I like hearing about your wedding!! !